Duffryn Recreational Grounds – Blaina. The Duffryn Recreation Ground had been a venue for sports since the mid 1850’s though the grounds you see today were laid down by groups of unemployed men working for the council within a scheme funded by various organisations over many years. The scheme also included funding for the Banna Recreation Grounds and the reconstruction of roads in the Nantyglo and Blaina area. Because of the many problems in the creation of the recreation grounds there wasn’t one specific completion and opening date, the grounds were being used, worked upon and was developed over a period of years. Below is a timeline of their development. The Early History of the Duffryn Field. On Friday 3rd June 1853 the Monmouthshire Merlin newspaper reported on a cricket match between the Blaina cricket team and Ebbw Vale. It was said to have taken place on the previous Monday afternoon 30th April 1853, played in a field on the Duffryn Farm just below the church and was stated to have been “A match of the manly amusement of cricket – the first of any character to have taken place in the neighbourhood“. It was reported that many supporters and friends accompanied both teams and the Blaina Brass Band led by Mr Rogers was also in attendance. Ebbw Vale – Mr Chippendale; Mr Ram; Mr Stone; Mr Roden; Mr Bevan; Mr R. Roden; Mr Williams; Mr Davies; Mr C. James; Mr Mr Trew and Mr A. Widdowson: In the return match at Ebbw Vale shortly after, the Blaina team were again the victors but by only one point. The game at Victoria was played during a hail storm which lasted for over an hour though the cricketers never left the field. There isn’t much information on the Duffryn Farm though on the 1840 tithe map there is a large farm situated at the north-eastern part of the field close to where the Blaina Bowls Club is today. I’m not sure how long the Duffryn Farm was occupied or how long the fields were used as a sports venue after the 1850’s though on the 1880 maps the farm buildings are still shown and known as the Duffryn, though the area was slowly being occupied by a refuse and waste tip extending from where the Pilgrims Park is today down to the Duffryn and being accessed by tramlines. On the 1901 maps the farm had gone. In the 1910’s there were reports of football being played on the Duffryn, as with other areas in the valley flat ground upon which to play sport was hard to come by and the various teams made do with any ground available with many waste tips utilised for such purpose. The Duffryn Field Recreational Ground Beginning. On Friday 25th November 1921 there was a report in the South Wales Gazette newspaper on the “Work for the unemployed”. It stated there were several schemes being discussed in the urban area so as to provide work for the large number of unemployed. Included in the schemes was the provision of a road to Perks Row, Nantyglo, a new road to Cwmcelyn from Blaina which was to be cut through a high tip, improvements to the main Cwmcelyn Road with the addition of a side path. The scheme also included the lay-out of the Duffryn Field for a recreation ground for the lower end of the Blaina area. On Monday 2nd January 1922 at a monthly meeting of the Nantyglo and Blaina Urban District Council in the Council Chambers, Blaina, the following members attended – Mr D. Haywood; Mr Evan Evans; Mr J. Francis; Mr G. H. Jenkins; Mr J. L. Adams; Mr Alfred Jones; Mr Llewellyn Williams; Mr W. H. Silk; Mr W. R. Woodman; Mr J. Chard; Mr L. A. Wallen (Clerk); Mr E. J. Helt (Assistant Clerk); Mr J. E. M. Job (Surveyor) and Mr W. T. Angell (Sanitary Inspector): At this meeting the proposed recreation grounds for the unemployed schemes were discussed. A letter was read from Mr Vachell stating that the Nantyglo and Blaina Ironworks Company Limited were prepared to accept £500 for the Duffryn Field and £200 for the freehold portion of the Banna site, Nantyglo and their leasehold interest in the remaining portion. The council said they could secure a loan of £30,000 from the Public Works Loan Board for the laying out of recreation ground but had to acquire the freehold. Harsh words were exchanged when Mr Alfred Jones said that “More than £40,000 had been taken from the workers by this Nantyglo and Blaina Ironworks Company which had the audacity to ask for £500 and £200 for rotten tips and a field”. He went on to say “The company could give the ground but for the sake of a small sum they were depriving the area of a £30,000 loan”. Mr Jones informed the council that £165,000 in way-leaves, royalties and rents had been taken from the area by the company during the past five years and yet do nothing for the people. Mr Adams put a motion that he thought it best to get a valuation for the sites rather than just pay what the company wants. On Monday 28th April 1924 at a monthly meeting of the Nantyglo and Blaina Urban District Council in the Council Chambers, Blaina, the following members attended – Mr J. Lloyd; Mr W. Lloyd; Mr D. H. Griffiths; Mr D. H. Thomas; Mr E. Lewis; Mr L. Chaffey; Mr W. Hale; Mr S. Short; Mr W. T. Aubrey; Mr H. Ashton; Mr Evan Evans; Mr G. H. Jenkins; Mr T. Jenkin Williams; Mr J. L. Adams; Mr L. A. Wallen (Clerk); Mr E. J. Helt (Assistant Clerk); Mr J. E. M. Job (Surveyor): At this meeting the clerk produced the duplicate conveyances of the Banna Field, Nantyglo and the Duffryn Field, Blaina. Also it was resolved that the common Seal of the Council be affixed. The cheques valued £520 and £42. 11s. 1d. were drawn from the Miners Welfare Fund account in favour of Messrs Colborne and Co, solicitors of Newport in payment of the total money and costs respectively. In March 1925 a problem arose in connection with the Duffryn and Banna Field for the relief of the unemployment. Assistance had been obtained from the Guardians, the Unemployment Grants Committee and the Miners Welfare Schemes though unfortunately disputes had arisen because the Unemployment Grants Committee said that 75 per cent of those employed on the scheme should be ex-servicemen. There was a deadlock as the Miners Welfare Committee and the Unemployment Grants Committee could not agree as to the percentage of ex-servicemen and miners to be employed. In April 1925 the council stated that work on the Duffryn and Banna Recreation Grounds was to resume, though in later reports it seemed that work was suspended in the year 1925 owing to disagreements between the various Grants Committees and the uncertainty of a Miners Welfare Grant. On Monday 28th February 1927 at a monthly meeting of the Nantyglo and Blaina Urban District Council in the Council Chambers, Blaina, the following members attended – Mr L. Williams J.P., (Chairman); Mr E Evans; Mr A. Sharrem; Mr L. Chaffrey; Mr F. Cousins; Mr H. Ashton; Mr T. Jones; Mr W. H. Davies; Mr J. Chard; Mr C. Fear; Mr W. Lloyd; Mr E. Lewis; Mr J. L. Adams; Mr L. A. Wallen (Clerk); Mr E. J. Helt (Assistant Clerk); Mr J. E. M. Job (Surveyor) and Mr W. T. Angell (Sanitary Inspector) and Mr W. L. Beynon (Assistant Overseer): Mr Cousins asked a question on what steps the council were taking on obtaining the grant from the Miners Welfare Fund for the Duffryn Field Scheme. The clerk read a letter on the question from the Miners Welfare Fund which intimated that in view of the large number of applications and the small amount of money available for distribution there was no possibility of a grant until January 1st 1928. It was stated that applications held over from the year 1927 would receive first consideration. In April 1927 at a meeting of the council members it was announced that the Banna Recreation Park Scheme had been abandoned yet the Duffryn Field Scheme was ongoing. On Monday 25th July 1927 at a monthly meeting of the Nantyglo and Blaina Urban District Council in the Council Chambers, Blaina, the following members attended – Mr W. Lloyd J.P., (Chairman); Mr S. Short (Vice-Chairman); Mr E. Evans; Mr A. Sharrem; Mr J. L. Adams; Mr H. Ashton; Mr T. Jones; Mr E. Lewis; Mr C. Fear; Mr L. Williams; Mr E. Cousins; Mr L. Chaffey; Mr W. H. Davies; Mr L. A. Wallen (Clerk); Mr E. J. Helt (Assistant Clerk); Mr J. M. Job (Surveyor) and Mr W. L. Beynon (Rating Officer): At this meeting it was reported that Mr E. Cousins and Mr L. Williams had an interview with Mr Mason of the Industrial Welfare Society. The deputation reported that Mr Mason had promised consideration for the Recreation Ground Scheme, though Mr Adams proposed that the council would have had more luck with obtaining a grant if they initiated a scheme for an open-air baths! He had observed that the “children” were the first consideration in granting funds. He moved that the council instruct the surveyor to prepare plans for two schemes for open-air baths. Mr Jones seconded on condition that the children were taught swimming. It was stated that the sum of £3,000 had already been spent on the scheme and they were obliged to carry on with it. Mr A. Sharrem remarked that there was an open-air baths at Abertillery and it was only being used two months of the year. The motions were not carried as the chairman said that they could not deviate from the original applications for a grant. In December 1927 the Blaina Council confirmed a recommendation of the Roads and Town Improvements Committee, who had received a deputation from the Garnfach A.F. Club asking the council to provide a hut at the Banna Field, Nantyglo. The council offered them the use of the Council’s Stables at Cwm Crachen and would take steps to provide permanent buildings at the Banna and the Duffryn Field from money provided by the Miners Welfare Fund. By August 1928 a grant for the work to be carried out in connection with the Duffryn Field Recreation Ground was issued by the Miners Welfare Fund. The surveyor had been instructed to invite tenders for the work for a football field and bowling green. On Monday 27th August 1928 at a monthly meeting of the Nantyglo and Blaina Urban District Council in the Council Chambers, Blaina, the following members attended – Mr W. Lloyd; Mr J. Chard; Mr E. Silk; Mr Llewellyn Williams; Mr W. J. Owen; Mr E. Evans; Mr A. Sharrem; Mr J. L. Adams; Mr H. Ashton (Chairman); Mr T. Jones; Mr E. Lewis; Mr C. Fear; Mr L. Williams; Mr E. Cousins; Mr L. Chaffey; Mr W. H. Davies; Mr L. A. Wallen (Clerk); Mr E. J. Helt (Assistant Clerk); Mr J. M. Job (Surveyor); Mr W. T. Angell (Sanitary Inspector) and Mr W. L. Beynon (Rating Officer): At this meeting the Surveyor Mr J. M. Job submitted three tenders for the construction of the bowling green and football field on the Duffryn Recreation Ground. The cost of the bowling green was £597. 10s. 0d. and the football field was £1,343. Mr Job recommended the council accept the prices quoted by Messrs G. Chappell & Sons of Dinas Powis, subject to a further grant being obtained from the Miners Welfare Fund. After the tenders were accepted there doesn’t seem to have been much progress made and there were no reports issued in local papers. On Monday 29th April 1929 at an annual meeting of the Nantyglo and Blaina Council, the following members attended – Mr H. Ashton; Mr L. Chaffey; Mr C. Fear; Mr E. Cousins; Mr J. Chard; Mr T. W. Hale; Mr E. Silk M.A. LL.B. ; Mr A. Sharrem; Mr W. Lloyd; Mr T. Jones; Mr E. Lewis; Mr E. Evans; Mr J. L. Adams; Mr L. A. Wallen (Clerk); Mr E. J. Helt (Assistant Clerk); Mr J. M. Job (Surveyor) and Mr W. Beynon (Rating Officer): The clerk Mr L. A. Wallen stated that several letter were received from the Blue Pilgrims (a charitable group of ladies who had done so much in Blaina for the relief of the suffering). The chief matter mentioned was a proposal to convert the ash tip on the Duffryn into a playground. The clerk said the only hurdle would be getting a man to look after the ground. He suggested to the pilgrims that they might want to take a portion of the ground by the Blaina Reading Institute so as the caretaker of which could look after it. The pilgrims replied that they would take that ground as well as the ash tip, Mr Sharrem invited the Blue Pilgrims to the council chamber to discuss the matter mentioned. In November 1929 severe storms in the Blaina area resulted in the Duffryn Field being flooded. Inspections by the council showed that there was only 7′ feet between the water line and the tennis courts. Men were sent to try and prevent further damage though it was agreed to wait for a week when the water might have abated. In January 1930 Mr C. S. Mason, District Organiser of the Miners Welfare Fund, Cardiff, asked the Nantyglo and Blaina Council to send him the plans, specifications and estimates for the proposed work to be carried out on the Blaina Park, Duffryn Field and the Banna Park, Nantyglo in order to provide children’s playgrounds in those areas. In July 1930 a report in the South Wales Gazette inferred that the earlier Duffryn and Banna Park schemes were a fiasco, Councillor Mr Silk said he “Was keen that the schemes were to be carried out by direct labour though the last scheme at the Duffryn was badly managed”. Mr Sharrem said “The schemes would have to be carried out by contract or they would not get the grants promised to them”. Mr J. L. Adams said the work would have to be carried out by direct labour and the motion carried. In August 1930 the council forwarded the plans of the Duffryn and Banna Park schemes to those involved. On Thursday 2nd October 1930 at a special meeting of the Nantyglo and Blaina Urban District Council in the Council Chambers, Blaina, the following members attended – Mr E. Lewis (Chairman); Mr E. Cousins (Vice-Chairman); Mr E. Silk M.A., LL.B. ; Mr J. L. Adams; Mr C. Fear; Mr W. Lloyd; Mr E. Evans; Mr T. Jones; Mr A. H. Sharrem; Mr H. Ashton; Mr Llewellyn Williams; Mr J. Chard; Mr L. Chaffey; Mr W. T. Hale; Mr L. A. Wallen (Clerk); Mr E. J. Helt (Deputy Clerk); Mr W. L. Beynon (Rating Officer) and Mr J. E. M. Job (Surveyor): At this meeting a foreman for council work and other schemes was appointed with a salary of £4 per week. There were 66 applications for the post, the list was reduced to six by a ballot and in the final voting Mr Thomas Jones of Blaina received 11 votes and Mr Howell Morgan of Blaina received 3 votes. Mr Thomas Jones was appointed. Mr Cousins argued that he was under the impression that there would be one foreman per scheme, though after a lengthy discussion it was decided to appoint just one man to oversee the both schemes. In October 1930 Mr Adams of the Nantyglo and Blaina Council announced that the Duffryn and Banna Park Schemes was to commence shortly and he appealed to the Ministry of Health for the workmen to be issued with the appropriate work-wear, he said they had been unemployed for so long that they were not prepared for working in dirty conditions. 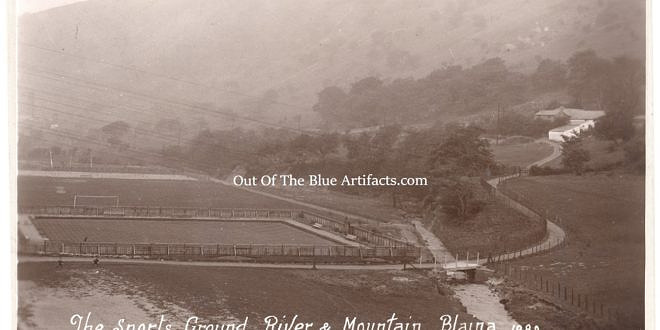 In December 1930 it was announced in the South Wales Gazette that the work of laying out the Duffryn Field, Blaina as a (Football Ground, Bowling Green and Tennis Courts) had commenced. The contract price was £2,390 and that the contractors were Messrs G. Chappell & Sons of Dinas Powis. A few weeks later Mr Adams of the Nantyglo and Blaina Council was concerned that the contractors had started work on the Duffryn Field but not the Banna, in reply he was told that the Banna was plain sailing yet the Duffryn Park needed draining and the work would take longer. Mr Adams stated he wanted to see men employed on the Banna which was essential for the provision of work for the unemployed. There was also a grievance with the workmen’s boots, the men had been working in wet conditions for so long their boots were rotten and falling off their feet. They said if they were to work on these schemes were they not entitled to have a decent pair of boots? In March 1931 it was announced that steady progress continues to be made in connection with the Unemployment Schemes in the Blaina area – The Cwmcelyn New Bridge, The Duffryn Recreation Scheme, The Blaina Recreation Ground and also several roads in the area which hadn’t been repaired for years though were reconstructed in the past few weeks. In May 1931 it was reported that each of the three wards in the Blaina and Nantyglo area will soon have its own recreation grounds. The Banna Park in the north ward which is in course of construction with a contract of £1,620 will provide football facilities, a bowling green and a tennis court. The central ward has the park with facilities for football etc. The south ward will have the Duffryn Ground which was stated as being in course of construction with a £2,390 contract price. There was also concerns over the closure of the right-of-way close to Gwaelod-y-Gelli Farm, it was noted that people could not walk from north to south. Mr Sharrem said that the right-of-way in that place had been closed for many years, long before the present owner had taken over the farm. In October 1931 at a special meeting of the Nantyglo and Blaina Council the names and addresses and previous experience of 69 applicants for the post of groundsmen at the Banna and the Duffryn was submitted. Votes were taken by a show of hands and it was resolved that Mr W. G. Evans of 23 Bailey Street, Wattstown, Rhondda and Mr Cyril Barnes of The Firs, Mount Pleasant East, Blaina be appointed Groundsmen temporary for 12 months on a salary of £3 per week. Mr Evans at the Banna Park and Mr Barnes at the Duffryn Ground. The council also received a deputation from the Blaina Bowls Club in October asking the assistance of the council in obtaining bowls for the bowling greens at the Banna and the Duffryn Greens and they also urged the council to put the greens at both parks in a playable condition. The Official Openings of the Recreation Grounds. On Monday 25th January 1932 It was announced in a Nantyglo and Blaina Council meeting that it was decided to open the Banna Ground at Nantyglo on Monday 4th April and the Duffryn Ground on Wednesday 6th April 1932. The report stated that both the Banna and the Duffryn contain football fields, tennis courts, bowling and putting greens. Their construction formed part of a scheme submitted by the local council to the ministry where many unemployed men were temporarily provided with work. Capt E. Silk M.A. LL.B. complained that both recreation grounds were far from completion and the council should try to open parts of the grounds that have been finished. He said the tennis courts at Nantyglo were ready though apart from that everything else was in chaos. The putting greens were less than half finished and the council should push for a completion date before the summer as come and gone. The councillors Messrs Adams and Mr C. Fear the chairman said that the condition of the Duffryn fields after the recent flooding was deplorable and that it would never be a proper recreational grounds until the flooding problem was sorted once and for all. At this meeting it was stated that the cost of contract price on the Banna was £1,620 and the Duffryn cost £2,390. Mr Adams said the council would have to spend an extra £3,000 to put the grounds in order and he said “I feel ashamed of our grounds when I look at those in Abertillery and further down the valley”. Mr J. Chard seconded the resolution moved by Mr Adams that the grounds be opened on the dates mentioned. In March 1932 the council surveyor was instructed to prepare plans and specifications for the provision of children’s playgrounds at the Banna and Duffryn Recreation Grounds. The application for grants for the costs were to be made by the Unemployment Grants Committee and the National Playing Fields Association. The Sports Clubs and Teams. In April 1932 deputations were received at a meeting of the Roads and Town Improvements Committee from the Claytown and Blaina Wesleyan Cricket Clubs for the use of the Duffryn Recreation Ground during the 1932-33 season, they would play on alternate Saturdays. It was decided that the Nantyglo and Blaina Bowling Clubs be granted permission to play on the Banna and the Duffryn respectively during the coming season. In July 1932 at a meeting of the Roads and Town Improvements Committee it was resolved that a further supply of “overshoes” be purchased for the bowling greens at both grounds. ladies lavatories were to be provided as soon as possible at both grounds. The surveyor was to make plans for a skittle alley at the Banna Recreation Ground. The surveyor was asked to authorise permission to caterers to sell refreshments at the Banna and Duffryn at a rate of 2s. 6d. per stall per day with no trading on Sundays. 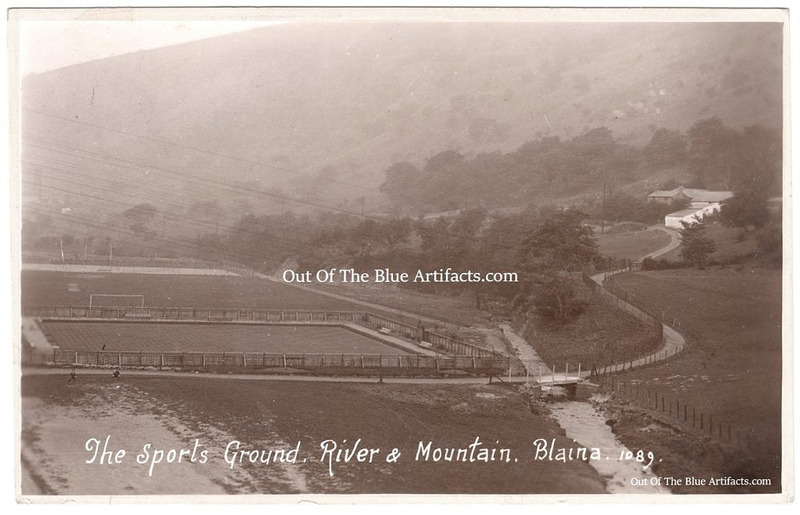 In September 1932 at a meeting of the Roads and Town Improvements Committee it was decided to grant the Garnfach School the use of the Banna Recreation Ground and the Blaina Central School the use of the Duffryn Recreation Grounds for their school football teams. On Sunday 28th August 1932 the Brynmawr Silver Band gave an open-air concert at the Duffryn Recreation Ground for the benefit of the newly formed Town Band. In September 1932 applications for the use of the grounds for the coming season were received from seven football teams. The council decided to allow the Blaina Town A.F.C. and Duffryn Harlequins to use the Duffryn Recreation Ground on alternate Saturdays. Blaina R.F.C. and Cwmcelyn R.F.C. the use of Blaina Park and Nantyglo All Blacks R.F.C. and Garnvach R.F.C. the use of the Banna Grounds. The Blaina Shop Assistants R.F.C. could make use of either grounds on Wednesdays. On Monday 26th June 1933 at a monthly meeting of the Nantyglo and Blaina Urban District Council in the Council Chambers, Blaina, the following members attended – Mr T. Jones (Chairman); Mr E. Silk M.A LL.B., (Vice Chairman); Mr Evan Evans; Mr W,. Lloyd; Mr A. H. Sharrem; Mr W. Madden; Mr C. Fear; Mr J. L. Adams; Mr W. W. Hale; Mr J. Jones; Mr D. Williams; Mr E. Lewis; Mr J. Chard; Mr L. A. Wallen (Clerk); Mr E. J. Helt (Deputy Clerk); Mr W. L. Beynon (Rating Officer); Mr T. W. Angell (Sanitary Inspector) and Mr J. E. M. Job (Surveyor): The minutes of this meeting showed that the Finance Committee received a deputation consisting of Mr A. Bainton and Mr Goodwin from the Blaina branch of the British Legion. The deputation ask for the councils support and co-operation to the proposal of the British Legion regarding a commemoration of the men who fell in the Great War. The proposal of the British Legion was to plant an avenue of trees alongside the road leading from the Crown Crossing to the Duffryn Recreation Ground. On Wednesday 12th July 1933 the first annual Fete and Gala with a Children’s Sports Day in connection with the Blaina Town Band was held at the Duffryn Recreation Ground. The Fete was opened by Mrs E. Athay. In August 1933 the council agreed to give permission for the British Legion to plant an avenue of trees alongside the road leading from the Crown Crossing to the Duffryn Recreation Ground providing that the groundsman at the Duffryn be allowed to advise the British Legion on the planting of the trees and they also gave permission for the use of the council’s motor lorry in connection with the work. At a council meeting on Monday 23rd April 1934 Mr Adams moved that the council approach the National Playing Fields Association to ask for a grant for the purpose of putting the playing portions of the recreation grounds in the district suitable for children. It was stated that over the last few years hundreds of tons of rubbish had been tipped on a section of the Duffryn and the children were playing on tins and glass. It was decided to ask for a grant and to get the support of the local branch of the National Union of Teachers in making the application. At the same meeting Mr E. Jeffreys and Mr T. Llewellyn representatives of the Blaina Methodists Cricket Club applied to for the use of the Duffryn Recreation Ground for the 1934-35 coming season. The club was granted use of the ground for a fee of 1 guinea and to practice on two evenings a week Tuesday and Thursday. In August 1934 the council announced that they were prepared to increase the wages of the groundsmen at the Bann and Duffryn Recreation Grounds from £3 to £3. 7s. 6d. per week. The council also recommended to limit the working hours of the groundsmen to 48 hours per week. In November 1935 it was announced that the council were to erect pavilions at the Banna and the Duffryn Recreation Grounds at £600 each. They stated they would approach the Ministry of Health for sanction to borrow £250 to augment the promised grant of £950 from the Miners Welfare Fund. In June 1936 the planned pageant to have been held on the Duffryn Field was postponed for a month owing to the failure to produce the many costumes need for the show. It was announced that the scene managers under Miss Dorothy Quirk was busy rehearsing and will now be ready for the show to take place in the middle of July. The pageant will be opened by the famous Australian born film star Miss Betty Stockfield, who had Welsh ancestry. Miss Stockfield’s visit was courtesy of Mr J. Woolf, General Film Distributors Ltd, 127-133 Wardour Street, London W.1. She was under contract to a French film company with which she was filming though they told her they would postpone production for her to open the show at Blaina. On Friday and Saturday 17th and 18th July 1936 the Blaina Pageant did not go ahead as planned as of the adverse weather conditions. A large crowd turned out at the Duffryn Field and Miss Betty Stockfield attended and presided over the opening ceremony though heavy rain and thunder storms prevented the show from beginning. It was announced that the pageant would be postponed until September 23rd, 25th and 26th. 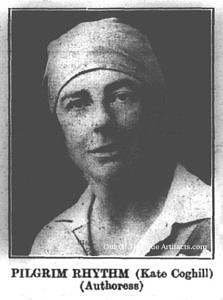 Later a letter was read from Miss Betty Stockwell in which she wrote “Had enjoyed her time in Blaina, she had visited the Nantyglo & Blaina Hospital, talked to an old miner who was recovering from a broken leg he had received in a colliery accident. She also hoped that the re-arranged pageant would be a great success” and said she would be back to visit Blaina to do some mountain climbing. On Wednesday 23rd September 1936 the Blaina Pageant at the Duffryn Field went ahead. It had been postponed on a few occasions as mentioned, though the weather had settled and as many people had travelled from London and the Rhondda Valley, South Wales, the pageant was officially opened by Mrs Douglas Coghill, Pilgrim Rhythm, (Miss Kate Coghill’s) mother. The main show on the Duffryn Field would be followed by other shows on Friday 25th for the children of South Wales and Monmouthshire and Saturday evening 26th September will be another performance. On Friday 30th October 1936 Pilgrim Rhythm (Kate Coghill) the authoress and organiser of the Blaina Peace Pageant that had been held in September along with Miss A. Parkes the treasurer and Mr Albert Ball the chairman on behalf of the Pageant Committee attended as a deputation and handed over a cheque of £150, equivalent to £9,780,00 in today’s money, the proceeds of the pageant to the Nantyglo and Blaina Hospital Fund. In May 1936 at a meeting of the Nantyglo and Blaina Council, Capt Silk raised the question of the refuse being tipped on the lower section of the Duffryn Recreation Ground and that the tipping should be stopped. Mr Joseph Chard told of how he had seen children throwing dead cats around, there were even dead sheep on the tip and that it was a danger to health. Mr T. Hale said of his concerns to a forthcoming fete to be held on the ground and that it should be put in a good condition for the sake of the many visitors. Mr J. H. Durban said it was a filthy hole and it was decided to ask Mr J. E. M. Job the surveyor to get the tipping on the ground stopped and for the workmen to clean up the area. The Duffryn Recreation Grounds are still in good order and being used, there is also a Bowls Club at the grounds. I will upload more information, various team and club individual names as I get them. Points of interest – The photograph in the featured image above shows the Duffryn Recreation Grounds (centre left) the small footbridge over the River Ebbw (right) with the Gwaelod-y-Gelli Farm (far right). In the distance (far left) are the ruins of the South Griffin Colliery, closed since the early 1920’s the colliery site was used as a film location for the H. G. Wells blockbuster “The Shape Of Things To Come” which was filmed in May 1935. The Duffryn Grounds are situated close to Glan Ebbw, West Side, Blaina.